Inspired by yesterday’s post, I hit up the grocery store to get restocked post-Florida trip. When I travel a lot I tend to get lazy about grocery shopping and eat out a lot. This is not good for my bank account or my lifestyle! Mike and I are heading back out of town (with Fig) on Tuesday night for spend 5 days in North Carolina with my family, so I pre-planned meals to not over buy on groceries. Plus, I notice that Tina from Carrots’n’Cake pre-plans dinners for her weekly shopping trip and I thought it was a great idea! Here’s my dinner plan until Tuesday. Friday: Pre-Saturday Long Run meal. Whole wheat pasta with ground turkey, marinara, broccoli and spinach. Last night I went to a long, hot, sweaty yoga class and Mike has his track workout, so we had a later dinner at my house. Mike really likes jalapenos, but I have to admit they’re not my favorite. I like spicy foods mostly if they’re Asian or Indian flavors, but for whatever reason I’m not a huge fan of spicy peppers like jabaneros or jalapenos. I also am kind of afraid to cook with them because I don’t want to accidentally get the oils in my eye (probably irrational but whatever). But when I saw this recipe from SkinnyTaste I knew I had to make it for him. I decided to compromise and scrape out about 1/3 – 1/2 of the seeds to regulate the spice. I probably could’ve left more but it was still tasty. I modified the recipe some but mostly because I had to. 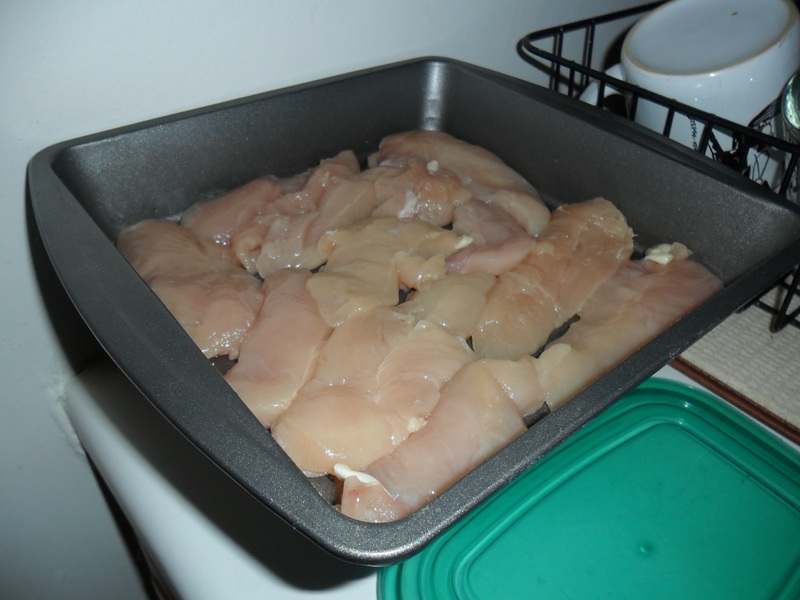 The chicken I bought ended up being much smaller pieces than I thought. I was pretty sure they wouldn’t be that great to stuff / roll up. I also elected not to use bacon, but that was just because I didn’t want to buy a whole thing of bacon. I didn’t end up missing it though. 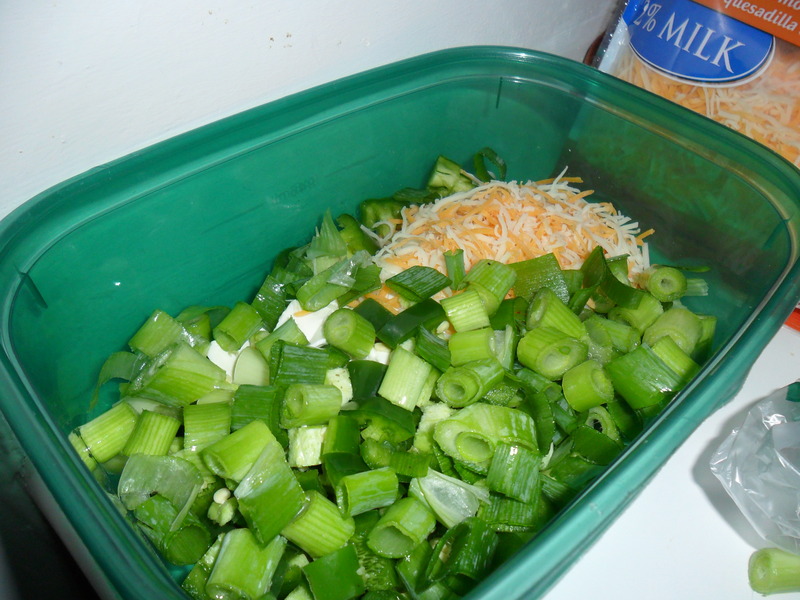 So instead of making roll ups like the recipe, I decided to gamble and turn in into a casserole. 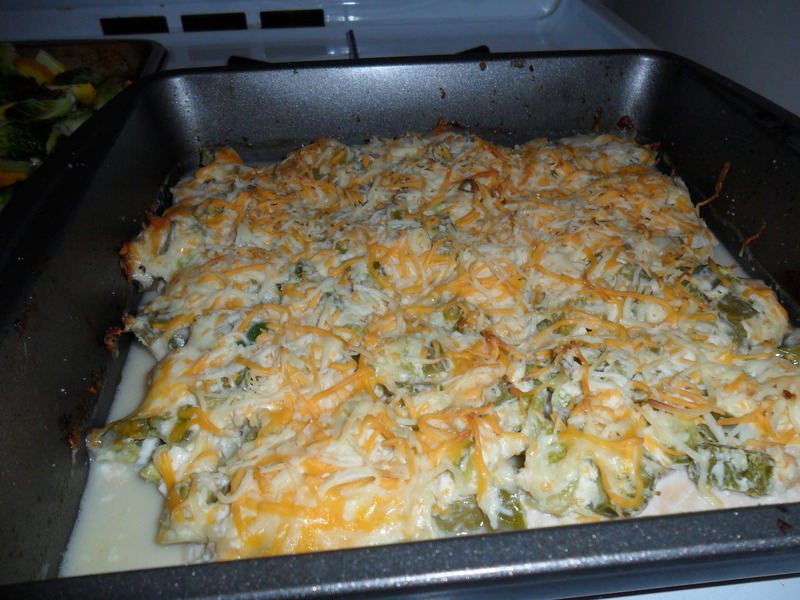 I lined the bottom of a pan with the chicken and spread the cheesy mixture on top. 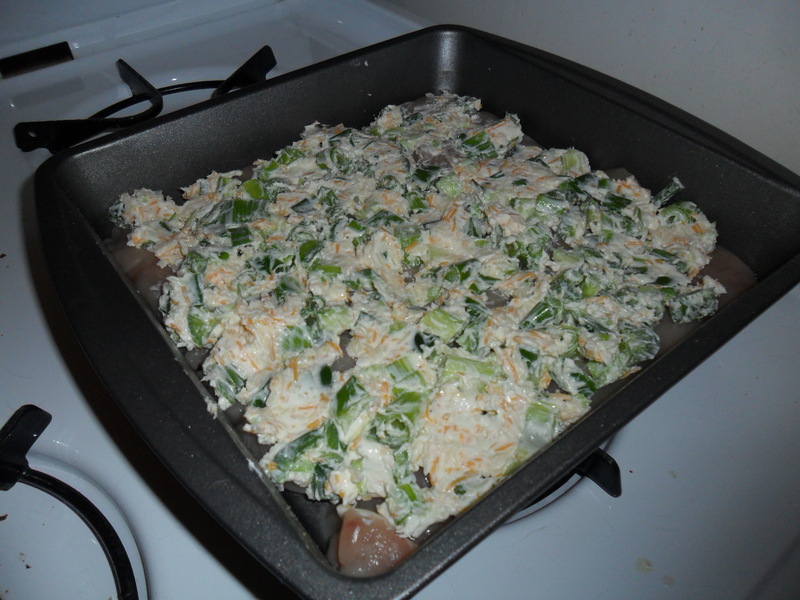 Instead of coating the chicken with bread crumbs, oil, and lime juice like the recipe indicated, I just sprinkled the final casserole with lime juice, a little salt, and some extra shredded cheese. 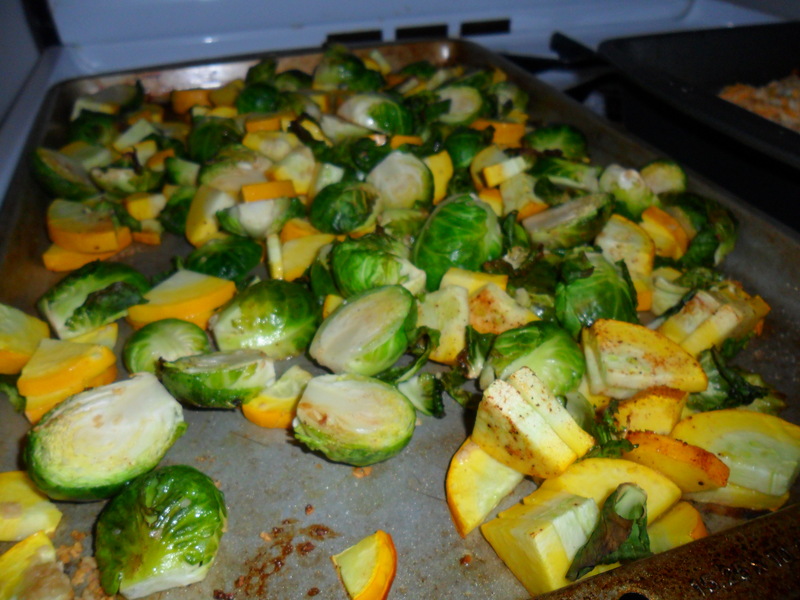 I also roasted some brussel sprouts with some yellow zucchini I found at the grocery store. I thought they were summer squash initially and when I realized what they were I was too intrigued not to buy them. They were DELICIOUS. Both Mike and I agreed we really liked them (I think I liked them more then summer squash). 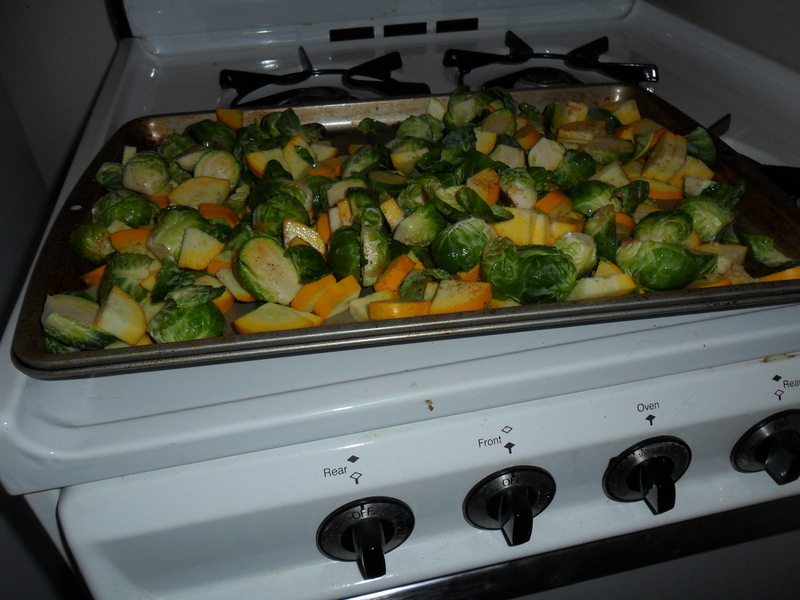 The veggies were just tossed with a little olive oil, minced garlic, and seasoned salt. The end result was DELICIOUS. The casserole turned out to be a perfectly acceptable alternative to the roll ups (though I’d still love to try the roll ups again some other time!). I tried to practice my new “hunger/satiety” strategies during this meal. I felt REALLY hungry right after yoga, but I had a big glass of water when I got home and that really curbed my appetite (it is absolutely true that most of the time when we think we’re hungry, we’re actually thirsty). I was still ready to eat, but I didn’t feel quite as ravenous. I drank another glass of water with a lime with dinner and tried to take my time while eating. I took smaller bites and chewed them a little more than usual. It really did help!